Pour the palm oil into a clean dry stainless steel or aluminium pot. Set on the stove and melt the oil at low heat. Remember, only melt the oil, do not allow it to heat up. Once melted, turn off the heat and add the ground Ogbono. Use your cooking spoon to dissolve the Ogbono in the oil. Keep stirring till the Ogbono has completely absorbed the meat stock. Add a small quantity of the hot water and stir till the Ogbono has absorbed all the water. 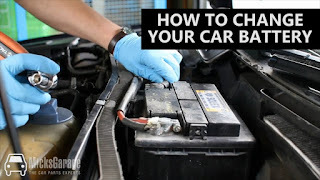 Repeat this process till you get a consistency that is shown in the video below. Making sure that your heat is set to low, cover the pot and start cooking. Once it starts to simmer, stir every 2-3 minutes for 20 minutes. So what you'll do is: every 3 minutes or so, open the pot, stir every well, scraping the Ogbono that sticks to the base of the pot, cover the pot and cook for another 3 minutes. After 20 minutes, the Ogbono should be well cooked and you will begin to perceive its nice flavour and aroma. Add the assorted meat and fish, ground crayfish, salt and pepper to taste. The Ogbono may have become thicker from the cooking. If so, add a little bit more water and stir very well. Cover and cook till the contents of the pot is well heated up. When the contents of the pot have heated up, add the vegetable (frozen Spinach used in the video). Stir very well, cover the pot and turn off the heat. Leave to stand for about 5 minutes and serve with any Fufu recipe. Serve Ogbono Soup with any Nigerian Fufu meal. My Ogbono Soup does not draw. Why? There are 3 main reasons why your Ogbono Soup does not draw. You bought the wrong seeds. There is another seed that looks so much like Ogbono and is sold as Ogbono seeds in Nigerian markets. First sign that you are buying the wrong seeds is if they are too cheap to be true. To confirm that the seeds are really Ogbono seeds: break the seed and rub the broken sides together, if they make a sap that draws, then you've got the real Ogbono seeds. In Nigeria, every open market seller should let you do this "drawing test", if not, please leave their shop and go somewhere else. Another reason why your Ogbono Soup does not draw may be because you used packaged ground Ogbono, ground being the keyword here. This is especially the case for those who live outside Nigeria who do not have any choice than to buy the ground packaged Ogbono sold in African shops. Once you grind Ogbono, it starts losing its potency to draw and with time, it won't draw anymore. The exact time at which it completely loses its potency to draw will depend on: how dry the Ogbono was before the grinding took place and how well it is packaged amongst other things. The third reason why your Ogbono Soup does not draw is that you fried it before adding the meat/fish stock. The ground Ogbono should only be dissolved in the palm oil NOT fried. The more you fry it, the more it loses its drawing ability till you've got no potency left. This happens even if it is the authentic Ogbono seed. How can I cook Ogbono Soup so that it does not burn? First, turn down the heat. Whatever you are cooking, turn down the heat to prevent burning. 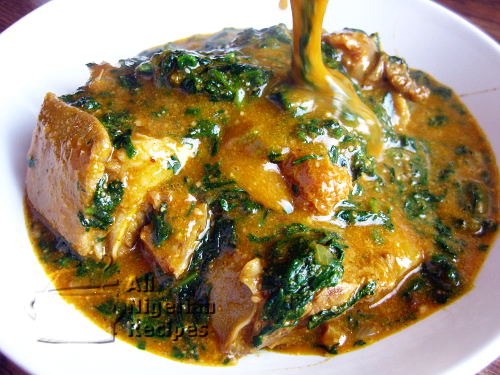 This is especially the case with Ogbono Soup which is very sticky. Always cook your Ogbono Soup at very low heat. If your cooker's heating ranges from 1 to 9, set the heat to 4. Secondly, do not add crayfish or any other ingredients when cooking the Ogbono at first. Crayfish especially speeds up the burning. When you grind your Ogbono in Nigerian markets, they will tell you to use crayfish to make sure all the Ogbono comes out of the mill. If you decide to do that, make sure that they put the crayfish and that last bit of Ogbono in a different plastic bag for you and add the crayfish bit when you add the rest of the ingredients. Also, use stainless steel or aluminium pots in cooking your Ogbono Soup. Non-stick pots are not the best for cooking Ogbono Soup even though it says non-stick lol! My Ogbono Soup tastes bland in spite of all the ingredients I usually add to it. Why is this? One reason Ogbono Soup will taste bland even after adding enough ingredients is that you did not cook it long enough. I have seen a lot of people cook Ogbono for only 5 minutes. That's not enough. Ogbono, once added, should be cooked for at least 20 minutes on low heat. This is the time at which the taste begins to come out and blend with the ingredients. Another reason is maybe because the Ogbono seeds have gone mouldy in which case, it will have a slightly bitter taste too.